Gurgaon-based Sky Gate Hospitality Pvt. Ltd, which runs food startup Biryani By Kilo, has raised pre-Series A funding from a clutch of investors, a top company executive told VCCircle. The company has raised Rs 5-10 crore ($763,000- $1.5 million) from existing as well as new investors by diluting a 10-15% stake. According to Biryani By Kilo founder Kaushik Roy, the money will be used to expand its footprint in the domestic market. Its existing investors, Rohit Chand, and his son Ashish of AxisCades Engineering Technologies Ltd, participated in this round through their family fund. The new investors included Kunal Khattar, a partner at Noida-based investment firm advantEdge Partners; Manish Vij of Vun Network; Harish Bahl of Smile Group; StartUp Equity Partners, a boutique investment banking and consulting firm founded by investment bankers Neeraj Batra and Gunit Chadha; Thapar Group; and Myron Ferro, the former business head of Cleartrip; among others. Biryani By Kilo will add two more cloud kitchens in Delhi-NCR to its existing seven by the end of this year. “Besides, the company will foray into the western belt by starting a kitchen in Mumbai,” said Biryani By Kilo director Vishal Jindal. A small part of the proceeds will be used to enhance its technology infrastructure, besides setting up a centralized production facility, Jindal added. The company, which had raised its angel round of funding early this year, is also planning to launch its services in the overseas market. “We are looking to have a master franchisee partner in the UAE, where we are planning to launch multiple kitchens,” said Roy. It has also started testing waters in the catering space. “We are offering our services to small parties or corporate gatherings of about 100,” Jindal said. At present, the startup claims to serve 15,000 orders every month, with an average order size of Rs 1,000. It is aiming to achieve an annual turnover of Rs 100 crore by 2020 from the current Rs 1.5-2 crore per month. The company is also in discussion with several consumer-focussed private equity players to raise its next round of funding. “We seek to raise $5-7 million for our Series A round. We hope to raise it by next year,” Jindal added. Biryani By Kilo was founded by Roy in May 2015, while Jindal, who was also part of the founding team of Carpediem Capital Partners, had joined the startup early last year. The company claims to model its business on the premium delivery concept. The biryanis are prepared in the dum style using handmade earthenware – handis and angeethis. The brand specialises in offering different types of biryani, besides kebabs, korma and breads. For every order, it provides ‘Aanch’, a chulha or stove, so that customers can warm their biryani at a time of their convenience and just before having it. The company operates on a hub-and-spoke model, providing raw material and semi-cooked produce to its outlets. It also delivers from its own kitchens catering to the population within a 10-12 km radius. Customers can place orders through the BBK mobile app, which is available both on iOS and Android, as well as through the web platform and call centres. Before launching BBK, Roy was the Group COO at Zooropa Foods, the investment arm of VC firm SAIF Partners that focuses on quick service restaurants investments. During his stint at Zooropa, he had made managed two investments, including Bengaluru-based Ammi’s Biryani and Gurgaon-based Dana Choga’s Kitchen. Jindal was earlier associated with Fidelity Ventures Pte. Ltd and Akshayam Capital Pte. Ltd.
On the aggregation side, the startup has an exclusive partnership with Zomato, while it has tie-ups with Roadrunnr and Jugnoo for deliveries. However, the company claims that 80% of the deliveries are managed by its in-house team. Hyderabad-based Paradise Food Court, backed by Samara Capital, and Bengaluru-based Mani’s Dum Biryani, which counts Navlok Ventures as its investor, dominate the southern states. Mani’s had also offered a partial exit to Navlok. In the north, Gurgaon-based Biryani Blues and Kolkata-based Guha Roy Food Joint & Hotel are running profitable businesses in their respective areas. 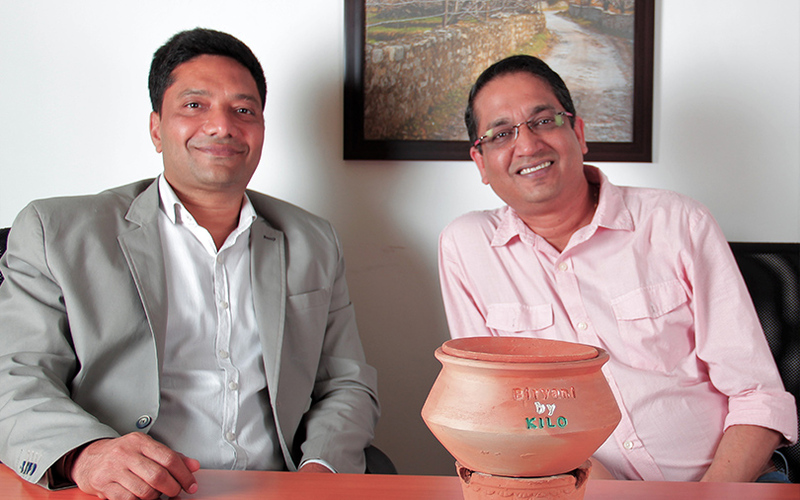 Last year, Biryani Blues had raised a bridge round of funding from Carpediem Capital Partners and other investors. The first reported institutional investment in the biryani restaurants segment was made by SAIF Partners in 2012 when it had backed TMA Hospitality Services Pvt. Ltd, which owns QSR chain Ammi’s Biryani. The PE firm is looking to sell its entire stake in the company. Many investors attribute the growth of biryani chains to standardisation and affordability. Most of these joints have stayed away from setting up a dine-in units due to high real estate costs. The delivery model makes the business far more scalable.